IPC India 2017 will celebrate the growing International Permaculture movement and network in its great diversity. Considering it in its “permanent culture” aspect, we are happy that so many artists performing different Indian arts are joining us to extend our view through a wonderful cultural programme. Every evening, after an intense days of presentations, workshops, demonstrations and networking, the stage will be given to other forms of human expression inspired by nature: dance, singing, painting, writing… Our partner Our Sacred Space, a Hyderabad-based cultural and sustainable living center will take us for a journey of discovery, or rediscovery, of local arts and culture. Hope you will enjoy the shows! Yodhayanam (Journey of the warrior) - A Kalaripayattu Performance. Kalarigram in Pondicherry is a Gurukulam for the ancient indian art form Kalarippayattu. 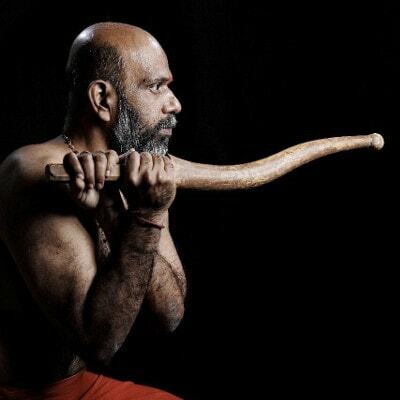 Kalaripayattu evolved as a methodology to fortify the strength and awareness of warriors. This is depicted in classic texts such as Dhanurveda and Sukra Niti. This tradition finds its underpinnings in the knowledge systems such as Tantra Shastra, Yoga Sutras, Ayurveda, Vaasthu and Jyotisha. Vipul Rikhi is a poet, fiction writer, translator and singer. 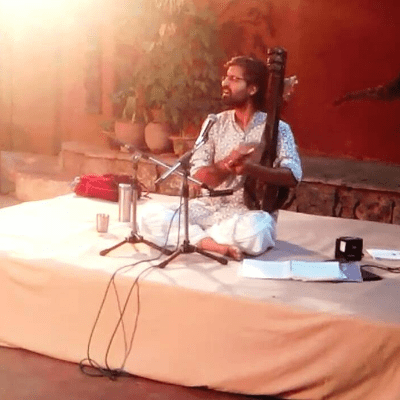 His work with Kabir Project includes extensive writings and translations in the field of Bhakti, Sufi and Baul poetry. In the course of these journeys he has developed a deep love for singing mystic poetry in the folk music traditions. In his satsangs and performances, he likes to bring equal emphasis to the poetry and its resonances in our lives as to the sheer beauty and simplicity of many of the folk tunes. He is also the author of a novel and collections of poetry and short stories. 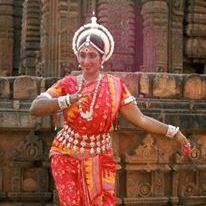 Nayantara Nanda Kumar is an environmental engineer and Odissi dancer. She is the founder of Our Sacred Space – a Cultural and Environmental center in Secunderabad. Dance evokes in her feelings a joy, gratitude and devotion. She will offer a performance of the major ancient Indian classical dance. Anita Peter is a danseuse in Mohiniyattam; the lyrical classical dance form of Kerala. Knowledge to Anita is like flowing water. The more that flows in, the more it has to flow out or else it becomes stagnant water. This is what instigated the desire to teach this dance form especially in a city where Mohiniyattam is less known i.e Hyderabad. She is the founder of the centre for performing arts, Lasya Drutha. Anita is trying to get this dance form to the Telugu community as well by choreographing with Music in Telugu. 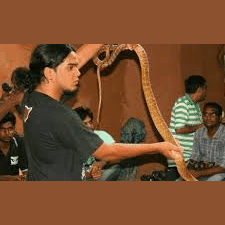 The Friends of Snakes Society is an Indian non-profit organisation dedicated to the protection of, and public education about, snakes. It was founded and registered under Society Registration Act in the year 1995 by Late Shri. Rajkumar Kanuri. With the help of Andhra Pradesh Forest Department, the Friends of Snakes Society has been rescuing snakes that enter human habitation and relocating them. The organisation also conducts awareness programs to spread awareness about these gravely misunderstood creatures, eradicating age old myths and misconceptions about them. The organisation regularly conducts awareness programmes in schools, colleges, public and private institutions, community centers etc. The three singers have performed in Rajasthan, Ravindra Bharathi and also in Singapore. They sing Carnatic music from South India, mainly the modern Indian states of Andhra Pradesh, Telangana, Karnataka, Kerala, and Tamil Nadu, as well as Sri Lanka. 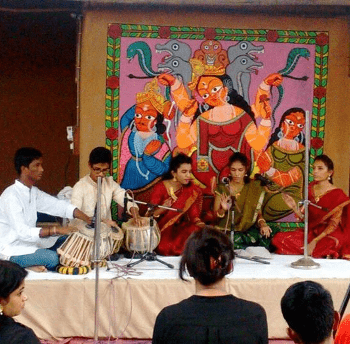 It is one of two main subgenres of Indian classical music that evolved from ancient Hindu traditions, the other subgenre being Hindustani music, which emerged as a distinct form because of Persian and Islamic influences in Northern India. The main emphasis in Carnatic music is on vocal music; most compositions are written to be sung, and even when played on instruments, they are meant to be performed in gāyaki (singing) style. Nitish Menon has many years of teaching and performing experience. He has attended many teaching workshops and seminars including those of the Salsa Congress and International Dance Sumit. He has also assisted teaching classes with the Dance Educators of India and also received awards for choreographies in many competitions. A Licence Zumba Fitness Instructor and trained Contemporary, Latin artist. Cheriyal scroll painting is one of the earliest forms of audio – visual entertainment and these paintings are prepared by only Nakashi caste people in Telangana state. Hundreds of year ago, the story telling communities used to travel through the villages of Telangana, singing and narrating stories using the scroll as their visual aid. The scroll measures about 3 feet in width and can extend over 60 feet. The scrolls contain about 40 to 50 panels, each depicting a part of the story and would be displayed as the story unfolds. Cheriyal paintings are a unique pictorial presentation of the numerous tales from Hindu epics like Mahabharata and Ramayana and the various Indian Puranas. They acted as wonderful means of communication, particularly useful for illiterate people and conveyed significant moral virtues, motivating people to be virtuous. The scrolls also depict the legends and mythologies of the communities along with their Gods and heroes. 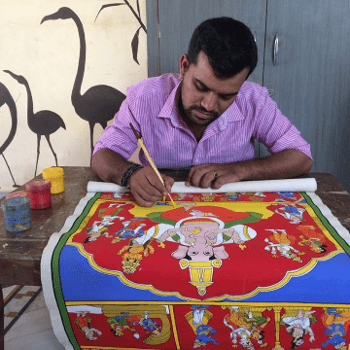 D.Venkataramana is a master craftsman in that art, participated in many national level programs, exhibitions and workshops from the government of India for developing this craft. 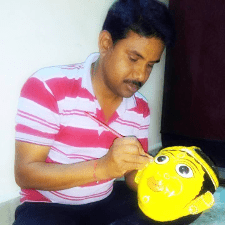 Cheriyal is only about a 100 km away from Hyderabad in Andhra Pradesh where Articians prepare these bright & colourful masks. The masks are lesser known as they are overshadowed by the scroll-paintings which this village is famous for. They really are miniatures of what must have been life-size, rather face-size, in earlier years. Wandering story-tellers used these masks in traditional story telling when they travelled from village to village. Drawn from daily life and mythology, the smaller masks and other toys would be sold in the village once the stories were done with. Painstakingly wrought using a light wood base, tamarind seeds and sawdust, these masks are intricately painted, mostly in a red or blue base colour. You will find villagers - men & women in traditional jewellery, turbans, brides & grooms, evil eye protectors/ demons and more. Today, they are used as decorative items for the home or on your desktop. They add a eye-popping splash of colour to a dull corner, brightening it immediately. Sri M. Krishnaiah is a Vamti Hamdri craft worker. He underwent training on making bamboo handicrafts and bamboo articles at Moosapet, in 2014. The training was organized by the DRDA project director Mahabubnagar. After completion of training, his wife, Smt. Anjalamma and he have continued creating different artistic bamboo articles and selling in the market. Before training they used to earn about Rs 150/day each but after training, they earn about Rs 400 to 600 / day each. They have conducted trainings in Our Sacred Space Organisation center at Secunderabad once a week for last 3 years and have trained about 100 members. 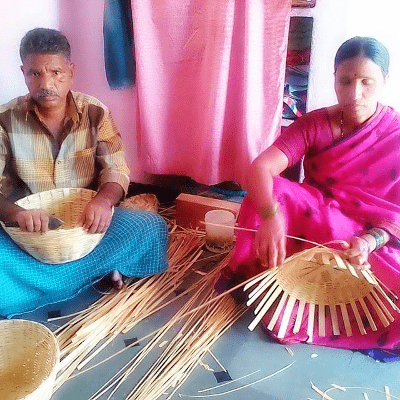 He has imparted training in some schools in Hyderabad, has conducted training in Khammam district for 75 days across 5 centers and trained about 150 members on preparation of modern bamboo articles which was sponsored by the E.D.B.C. Corporation, Khammam in 2015. He has thus become an expert in Bamboo Hamdri crafts and living with better wages. Messages to Mother Earth is a collaborative art workshop that is inspired by environmental concerns. As individual participants learn to make beautiful paper-beads, this workshop provides them an opportunity to express their concerns, hopes and feelings towards Earth.We will ask each participant to write a personal message to Mother Earth on a long strip of paper (which we pre-cut and give to each participant). After writing their message on the strip of paper, they are taught how to roll the colorful strip into a beautiful paper bead. Each participant can then choose to take a bead with them, leave it share with their fellow participants or string it together to honor a symbol on Mother Earth at the Convergence site. 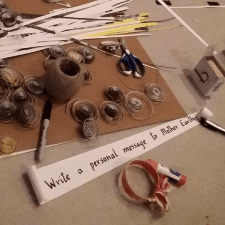 This is a simple, ephemeral, but thought-provoking, collaborative workshop that makes participants feel connected to Earth, teaches them the simple craft of paper-beads enabling them to make an interesting little work of art! Nenita is a multi-faceted youngster who has been trained in Bharatanatyam by the renowned Bharatanatyam exponent, Guru Smt. Rajeswari Sainath. 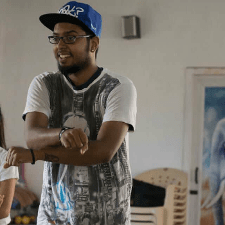 With respect to her training under both her Gurus and her undeterred passion for Bharatanatyam, she is driven to train future generations in this temple art form in a holistic manner. 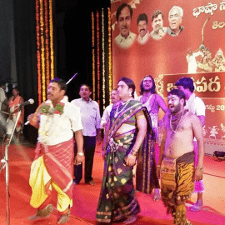 Oggu Katha is a very popular Traditional Folk Theatre form of Telangana. Oggu means“Damarukam” an instrument in hand, Katha means “Story”, by playing this instrument narrating the stories called “Oggu Katha”. This form is purely Shaiva Sampradayam , the castes of “Kuruma and Golla” communities living with this form as their livelihood. In this form Mallanna Katha , Beerappa Katha and Ellamma Katha are the traditional narrations popular among the hundreds of such stories. Who narrates Mallanna katha they will be called “Mallanna Poojarulu” and who narrates Beerappa Katha will be called “Beerla Poojarulu” both of them come under “Kurma & amp; Golla”communities. In particular seasons while performing about their own caste myths/gods they all go to outskirts of their villages and perform the rituals to goddess “Ganga” and “Snake”. While taking this possession towards outskirts of the village, among them the group of artists led at the front by doing Physical feat’s and rhythmic steps. With this performance the entire village will get vibrated and the people feel lots of entertainment during this whole process, especially the feat’s with knife’s and pyramid feat’s KNIFE’S and leads to extreme emotions of Roudra Rasa for the audiences. This whole process altogether called as Oggu Dollu Vinyasam”. This form will have 15 to 40 artists having individual “dolu” . Most colorful and eye feast happens at the end of this performance by introduction of the characters of Shiva devotees “Pothu Raju” and “Shiva Shakthulu” makes audience to feel entire atmosphere turns into divine and sense of Lord Shiva’s appearance. 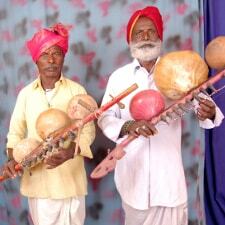 The erstwhile Deccan region had the presence of a large community of performers whose identity in terms of caste, community and way of living was distinct from any other performer.The ‘Kinnera’ musical instrument performers were one such community.A few of them still survive in the now Telangana State region.There is a distinct style of rendition of their performance with the language and rhetoric rendition of folklores which could highlight or challenge an establishment. They have always been more nomadic in nature and on the move.